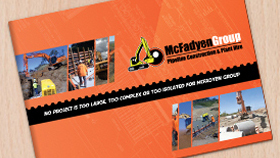 McFadyen Group - McFadyen Group is a privately owned company that offers excavator hire on the Gold Coast, QLD. We have a range of excavators for construction needs. Hiring good quality excavators can be difficult, particularly for large-scale projects. With expert service supervisors and support, McFadyen Group (MFG) is well known for their excavation experience. As a renowned Pipeline Construction and Plant Hire company in Australia, MFG’s Clients can choose from a range of high quality construction excavators to suit any of their project needs. Along with their construction services in Brisbane, MFG also offers Gold Coast excavator hire services across all regions. MFG’s services Brisbane and the Gold Coast with a range of excavator hire including ancillary equipment such as hammers, rippers, tilt, GP, and mud buckets. In order to reduce safety risks, it is essential to hire an excavator that is functioning optimally. MFG’s equipment is of the highest standard and regularly serviced to ensure it is dependable, safe, and efficient. Additionally, if an excavator needs servicing during a Client’s hire period at an isolated project site, MFG’s maintenance staff will visit the project to provide the service. With MFG’s equipment being used for some of the largest projects in South East Queensland and Northern New South Wales, MFG is fastidious in ensuring that only the highest quality Plant and Equipment is available. MFG’s modern and reliable Plant and Equipment comes from world-class brands, such as Caterpillar, JCB, Doosan, and Airman, and is available in different sizes to suit all project needs. These excavators can safely be used for large-scale construction projects such as the Brisbane’s Airport Link or the Ballina Bypass in New South Wales. For more information regarding mini excavator hire or any other type of excavator hire on the Gold Coast, QLD, contact MFG today. MFG’s expert service supervisors and support staff will be able to assist with any queries you may have regarding MFG’s excavators, other equipment or its Pipeline Construction services. MFG can also provide a quote for any Plant Hire services you require.